Attorneys for the three falsely accused players have filed their reply to the City of Durham’s brief, the final stage before the Supreme Court will decide whether to hear the appeal. A brief reminder on how we got here: a three-judge panel of the 4th Circuit essentially sided with Durham, dismissing all but one state claim on the grounds that the police were honest with Mike Nifong (acting, at the time, in his improper capacity as supervisor of the pre-indictment police investigation) about the evidentiary weaknesses in Crystal Mangum’s wild allegations; and a grand jury (acting, in the case of Sgt. Gottlieb’stestimony, on an erroneous recapitulation of the facts) returned indictments, breaking the chain between the police misconduct and the arrests. The falsely accused players appealed to the Supreme Court, citing three lines of argument. First, their brief noted that several other circuits had held that civil liability ensued for pre-indictment police misconduct, even when a prosecutor secures an indictment; and that the Supreme Court, in oral arguments for a case ultimately settled on other grounds (Pottawamie County), appeared to agree. Second, the petition suggested that the 4th Circuit had strengthened a circuit split on the question of whether police officers fabricating evidence during an investigation violates the Constitution. Finally, the players’ filing noted that even on its own terms (that an indictment wipes clear the city’s federal liability for everything that occurs before) the 4th Circuit’s ruling made no sense, given that the improper conduct by city employees (the harassment of Elmostafa, Sgt. Gottlieb’s magical “notes”) came after indictments occurred. The players’ reply opens with this wonderful line: “In a brief in opposition that is long on invective—and, for that matter, just plain long—[Durham] respondents seek to hold petitioners to an impossible burden.” The Durham argument amounts to a suggestion that because the Supreme Court has never before considered a case precisely like the lacrosse case (was there such a case? ), the Court should allow the 4th Circuit decision to stand. But the Supreme Court often hears cases that involve previously-unseen facts; the issue, as the reply brief correctly notes, is whether this case illustrates a split between the federal circuits on an important issue. And Durham never really argued otherwise. First, the brief dismisses Durham’s efforts to distinguish its conduct from cases in other circuits where governmental agents were held liable for federal violations. The city had claimed that all of these cases differed from the lacrosse case because in each of them, police had not fully shared information with the prosecutor, but had instead misled or withheld evidence from the prosecutor, which the Durham Police did not do. But the players’ reply brief observes that the circuits whose opinions are in question (the 2nd and 6th) did not, in fact, make such a hard and fast distinction, and certainly did not suggest that facts like the lacrosse case—in which police conspired with a prosecutor acting as their de facto supervisor to produce evidence to frame innocent people for a crime that never occurred—should be shielded from constitutional claims. Indeed, the brief notes that one case on which Durham relied (Wray v. City of New York) actually appears to back the players’ position, not Durham’s, on this point. Second, the brief reasons that the arguments in Durham’s filing “do not pass the smell test” regarding the city’s attempts to differentiate its behavior from earlier cases in which federal courts had found that “the fabrication of evidence at the investigation stage, standing alone, gives rise to a constitutional violation.” For instance, the brief observes, the City had tried to distinguish its behavior from a 1st Circuit case, Limone v. Condon, on grounds that the plaintiff in Limone was falsely imprisoned using fabricated evidence, while the lacrosse players were only falsely arrested, detained, and would have gone to trial but for a 9-8 decision by the State Bar to bring charges against Nifong. Yet the case that Durham believes helps in cause in fact says that “if any concept is fundamental to our American system of justice, it is that those charged with upholding the law are prohibited from deliberately fabricating evidence and framing individuals for crimes they did not commit.” Durham thinks that Limone helps its cause? The Court does not accept many cert grants. But if the justices decline to hear this case, and thereby allow the 4th Circuit ruling to stand, they’ll be saying that a victim of a police-prosecutor conspiracy to create evidence to indict the victim without merit has no federal constitutional claim in six states. That would be a terrifying precedent. So...you've got a Durham judicial system that gets a free pass to falsly accuse and arrest and detain anyone basically and a Durham police chief who thinks that Durham public defenders deserve to be shot, even when they are a innocent bystander in Durham. 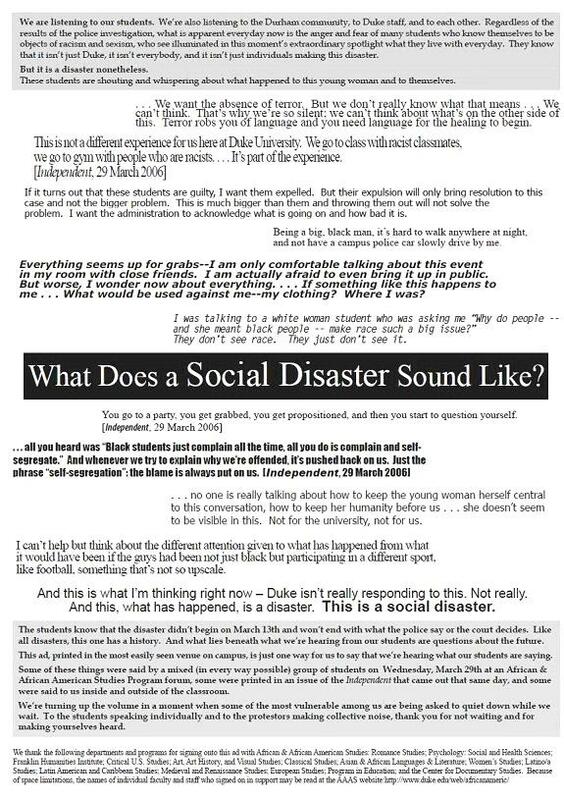 This is NOT just about these Duke students, it effects everyone - just like it has from the beginning. A LOT of people, too many to count, have been hurt tremendously by the party they decided to have that hasn't ended yet ... does it ever? We ALL (we the people type we all ... you know) DO hope that the duke lacrose players win btw. You're number !!!!!! !!!!!! !!!!!! !!!!!!!!!!!!!!!!!!!!!!!!!!!!!!!!!!!!!!!!!!!!!!!!!!!!!!!!!!!!!!!!!!!!!!!!!!!!!!!!!!!!!!!!!!!!!!!!!!!!!!!!!!!!!!!!!!!!!!!!!!!!!!!!!!!!!!!!!!!!!!!!!!!!!!!!!!!!!!!!!!!!!!!!!!!!!!!!!!!!!!!!!!!!!!!!!!!!!!!!!!!!!!!!!!!!!!!!!!!!!!!!!!!!!!!!!!!!!!!!!!!!!!!!!!!!!!!!!!!!!!!!!!!!!!!!!!!!!!!!!!!!!!!! "It's wonderful to be in the Blue Devil NATION, even if it's in the TarHeel State"
don't you really and truly begin to wonder what is really going on? If this case is lost, what does it mean for all NC citizens? What does it mean for ALL USA citizens? What does the reference to Blue Devil Nation imply and truly mean? Does the General also hold a dislike for other states, or only the TarHeel State? If they lose, I personally will never wonder again if that whole case was not set up from the very beginning to achieve the nefarious plans of those in coherts with the blue devil nation that stand against the constitutional rights of all USA citizens and the world. I have seen it like that from the beginning, but have been patient in my final analysis. At this point, there needs to be major public awareness of what is happening - so that the people who will be effected by this case can also have a say in matters, wouldn't you think - if it effects so many people? How can so many have their constitutional rights dissolved in one fail swoop without having a say in the matter? i ask you ... why? To further divide and incite hatred in the american public in order to find reason to further degrade constitutional rights for all americans ... all done with the cooperation of the Blue Devil Nation and with the terrorized corruption and brainwashed groomed support that is rampant in NC (because of duke to large degree). that's what happened and continues to happen. you then have an environment in which all NC citizens and all Duke students and all visitors to NC and Duke and Durham, and all in Durham and who conduct business in any way or who live or play in Durham at the mercy of those directly lead by the leaders of the Blue Devil Nation in their hate driven quest if they must trust Duke in any way - even in health services and judicial interfaces that have direct impact on life or death for all - doesn't matter who - ALL ARE EFFECTED by this, in NC especially, but anywhere that is touched by this hatred driven and driving 'service' to the people (and their 'land' and resources and constitutional rights). not because 'it' has to be this way. A passionately clear summary. Thank you. So ... why doesn't the part of Duke that doesn't agree with what is happening do anything about it? Are you saying this clear summary is correct - yet none of duke's lawyers will do anything to stop the injustice if it persists? How can so many at Duke lead the nation into such illness and loss of constitutional rights, and conduct business in such a way that seems to rely upon deception, chaos, and fear based societal control in such blatant ways? It is amazing to watch that Duke would have a gang of 88 for their own 'nation' but not one for the entire USA nation since they deem to lead the way for so many. Is everyone at Duke under some form of mind control where they cannot think or act for themselves if the rights and health of the USA public are at risk beyond the 'master plan' or whatever is guiding the way these days? What do they benefit if their rights are taken away if they remain silent and allow the destruction of this nation's judicial system that has traditionally been based upon the USA constitution and was designed to protect it's citizens from the harm that allowing these loss of rights will entail. Are they not USA citizens as well with the same possibility for ill effect if constitutional rights are dissolved? This part I do not understand, that you don't see more protest at Duke about what is truly happening. spoke out when Scottsboro II was taking place in their own backyard, to their own students. Doesn't anybody here know the difference between "affect" and "effect?" There's only one poster here who confuses "affect" and "effect". It's just that he writes 70% of the comments. yeah, and i bet your ONLY concern is that affect effects affect. concerned about anything else besides spelling? "So ... why doesn't the part of Duke that doesn't agree with what is happening do anything about it? Most don't care ("I see no evil."). The two or three who do have no influence. "Are you saying this clear summary is correct"
" - yet none of duke's lawyers will do anything to stop the injustice if it persists?" Worse. Unless there is an ideological regime change, they will perpetuate it. Exactly what ideological regime change are the hoping for? How do they plan to perpetuate the injustice (other than through this case which is rather obvious)? 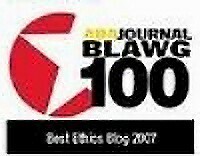 A good start is to get rid of the race/gender/class triumvirate (which KC has amply exposed). By continuing to push the same ideological agenda -- same cause, same effect. A new example of the same effect is the recent guidelines for "sexual assault" (which KC has also amply exposed). hey guiowen.....think this is mistrail-recluse running his/her mouth on DIW? It certainly looks like it. He misuses language in the same way. His misspellings (which for all I know are purposeful) seem the same. His syntax -- possibly an attempt to show us all how "earthy" he is -- seems the same.